Bump and jump with some rolling waves! If are looking for a spot to sail with more roll to the water than the north side of the Ferry Terminal, Gulf Road might be the spot for you! 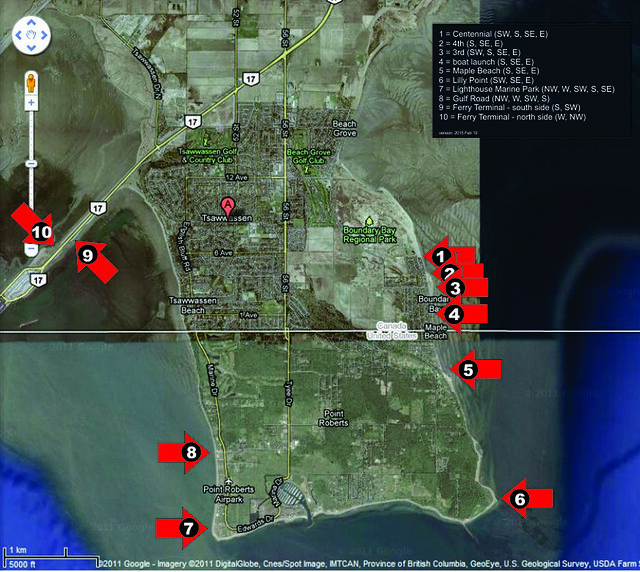 As shown on the map above, Gulf Road is one of four windsport beaches on Point Roberts – Maple Beach (5), Lilly Point (6), Lighthouse Park (7), and Gulf Road (8). This site has only been sailed recently on a small number of days so there is much to learn about it. On-street parking the south side of Gulf Road west of Front Street. This spot provides a great option for northwest wind, especially on those days when the wind is favouring the straight and not working at Acadia or the other beaches on Spanish Banks in Vancouver. 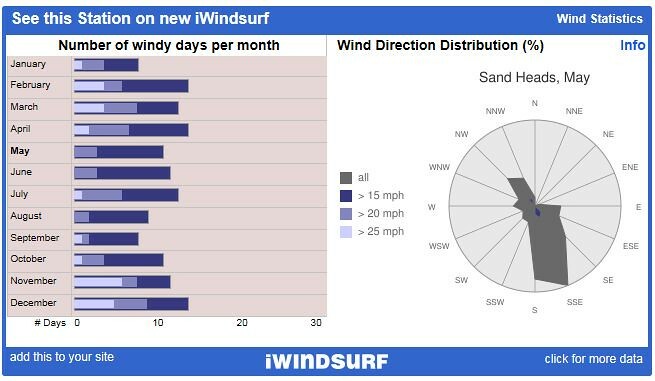 The wind data shown above is for Sand Heads and will over represent for Gulf Road during the summer months. Southeast (side offshore) through northwest (side onshore), although northwest is likely a better choice. Wind can shut down pretty quickly so keep fairly close to shore. Gulf Road can produce some nice organized rolling swell that sets up in lines near shore. It seems to work best on a mid-tide (~3 m) and can flatten out on a high tide (~4 m). 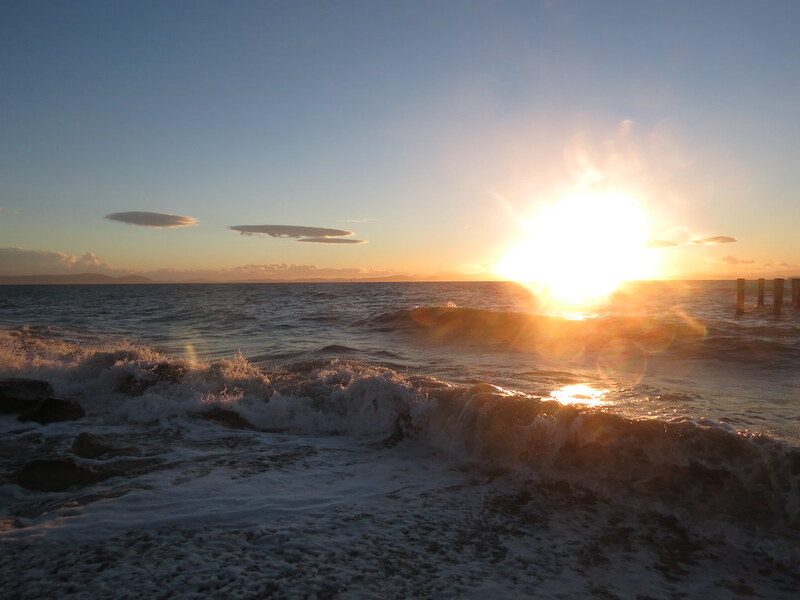 On winder days, the waves are generated by the rolling swell travelling down the straight. The stronger and longer the wind has been blowing in the north end of the straight, the larger the waves will be, particularly if the tide is working against the waves (or flooding). Huge expanse of water running about 19 km across to Galiano Island. It is possible to sail at Gulf Road on any tide height and even low tides don’t pull the water that far away. 1 m: To be determined. On a NW wind the south side of the piles seem to almost act like a jetty of sorts and seem to get the waves to wrap a little on the way in creating a subtle point break, given the right conditions. Right at the west end of Gulf Road. Grass on the south side of Gulf Road. 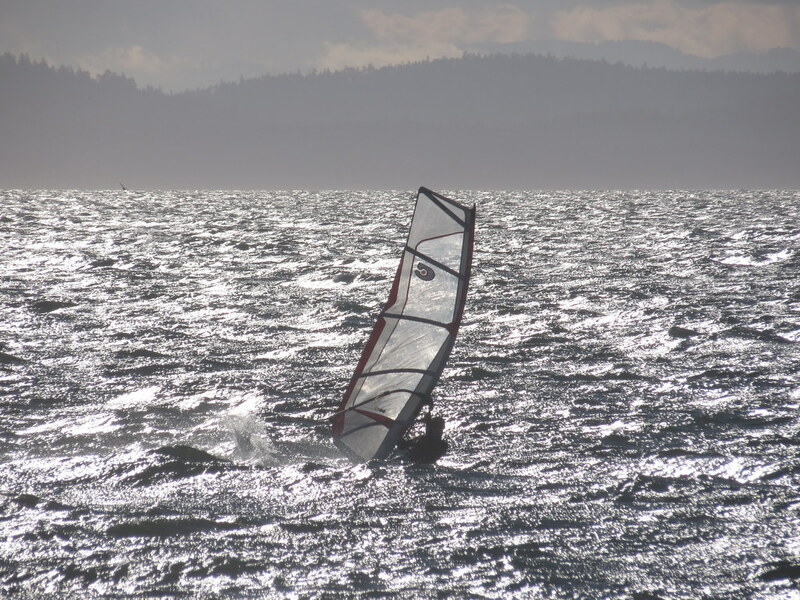 Easier windsurfing launch than Lighthouse Park (less current and less shore break). Looking to launch a kite? Best to head to the Ferry Terminal - no space for launching kites here and those huge piles off the beach could be troublesome. First Discovered By: M- can you claim this one? Thanks to Michael and DB for exploring and sharing what they know. \edit (2015 June 17) - "Eelgrass" added to the "Weeds" section. Last edited by C36 on Fri Apr 07, 2017 9:14 am, edited 8 times in total. Thanks again Dave for more of your hard work! C36 wrote: First Discovered By: M- can you claim this one? I'm sure there were others before me. 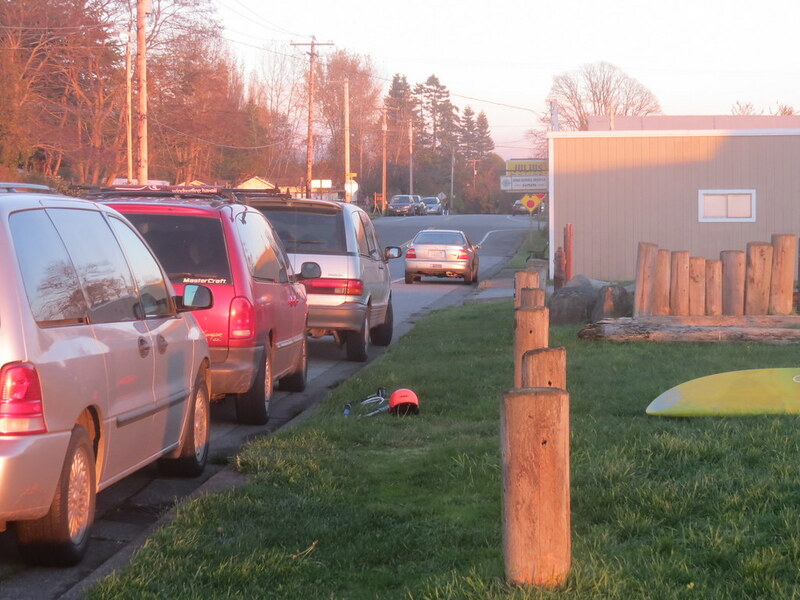 On-street parking the south side of Tyee Road west of Mill Road. I park in the parking lot right next to the beach but last time I was there I did ask the lady at the liquor store for permission as the restaurant was closed. Usually it's totally empty anyways. OSR from Michael at 6:28 am, June 9, 2015 wrote: Play to listen. Mid 2 m tide (as a point of reference). Michael wrote: First hour was best then the wind started coming in waves and wasn't quite filling into the beach. 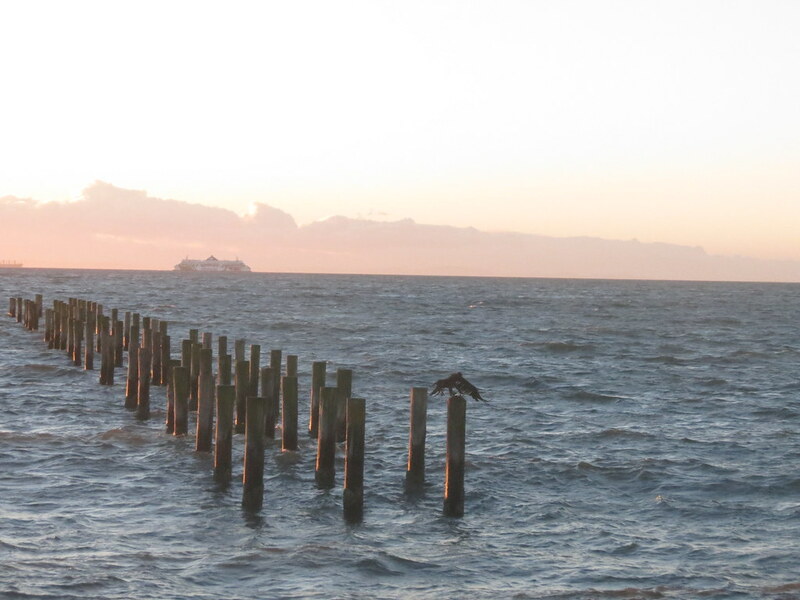 I think the old pilings were messing up the light wind on the south side but it was hard to stay up wind today. I think the ferry terminal would have been a better call but the waves suckered me in to staying at Gulf Rd. Also should have brought my SUP there were some nice breakers near the beach. It was challenging out there today with the sea state being large and choppy in between sets. When the wind filled in my 110 felt much too big and I was getting bounced around pretty good. Also really felt the current today which I think was creating the chop. 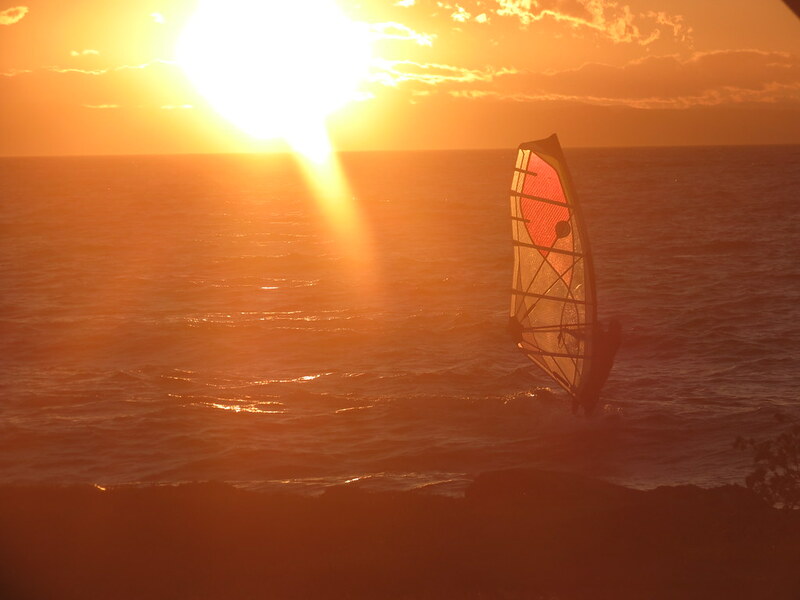 Big waves from all night winds, some shoulder high sets on the outside, but with the wind being up and down, either slogging or ripping, it was hard to enjoy them. Might try the terminal tomorrow. Last edited by C36 on Tue Jun 09, 2015 11:08 am, edited 1 time in total. 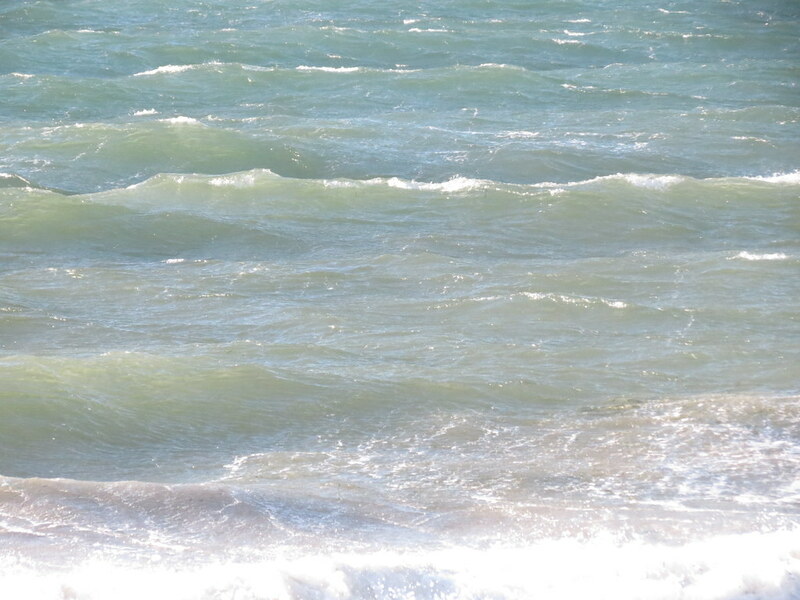 I didn't read through everything but here is a ridable wave on the Southern most point of Point Roberts. I managed to get quite a few turns in on this on my RRD FSW 105 a few years ago. West Wind. 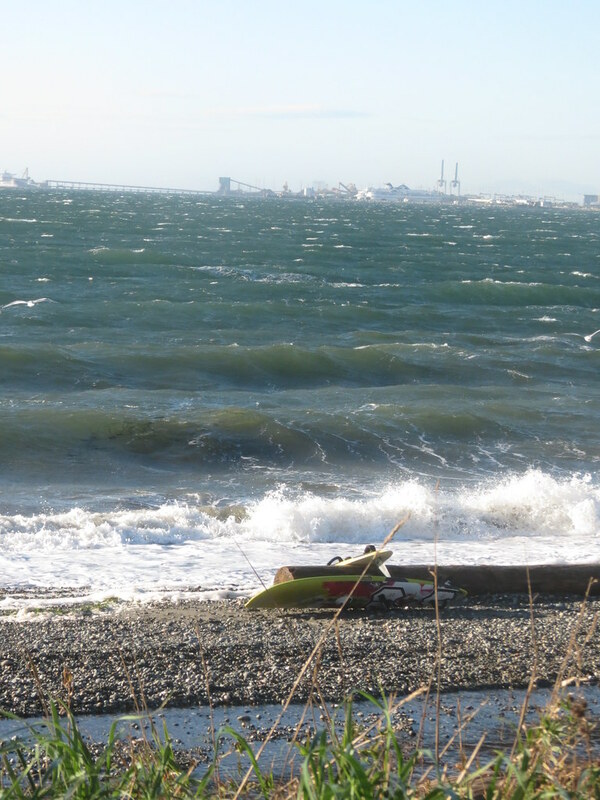 Ryan wrote: I didn't read through everything but there is a ridable wave on the Southern most point of Point Roberts. I managed to get quite a few turns in on this on my RRD FSW 105 a few years ago. West Wind. Nice surfing shot Ryan. That will be highlighted in another page - "Lighthouse Park". Stay tuned.